New Bothwell Sommerfeld Mennonite Church. Source: Sommerfeld Mennonite Church Centennial Celebrations, July 4, 1993, Morris, Manitoba, 1893-1993. 1993: 17. 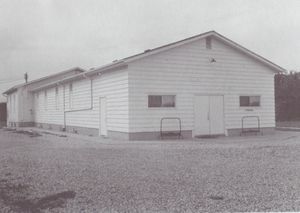 The New Bothwell Sommerfeld Mennonite congregation in New Bothwell, Manitoba began services in 1973. The first building was occupied in 1973, with several expansions in the following years. A new building was constructed on the same site in 1996. Sunday school began in 1973. In 1993 there were about 200 members. The congregation has been affiliated with the Sommerfeld Mennonite Church of Manitoba. The language of worship is German, with some English. Abram B. Reimer and John Voth were ordained as leaders for the congregation in 1986. The church is located just north of Highway 52 on the west side of provincial road 216. Bergen, Peter, comp. History of the Sommerfeld Mennonite Church, That is the Background and First Hundred Years of the Sommerfeld Mennonite Church. Altona, MB: Sommerfeld Mennonite Church, 2001: 211. Peters, Jake. "An Annotated Bibliography of Materials Relating to the Sommerfelder Mennonite Church." Research paper, Canadian Mennonite Bible College, 1979. Sommerfeld Mennonite Church centennial celebrations, July 4, 1993, Morris, Manitoba, 1893-1993. 1993: 17. Steiner, Sam. "New Bothwell Sommerfeld Mennonite Church (New Bothwell, Manitoba, Canada)." Global Anabaptist Mennonite Encyclopedia Online. April 1997. Web. 19 Apr 2019. http://gameo.org/index.php?title=New_Bothwell_Sommerfeld_Mennonite_Church_(New_Bothwell,_Manitoba,_Canada)&oldid=132953. Steiner, Sam. (April 1997). New Bothwell Sommerfeld Mennonite Church (New Bothwell, Manitoba, Canada). Global Anabaptist Mennonite Encyclopedia Online. Retrieved 19 April 2019, from http://gameo.org/index.php?title=New_Bothwell_Sommerfeld_Mennonite_Church_(New_Bothwell,_Manitoba,_Canada)&oldid=132953. This page was last modified on 7 December 2015, at 01:14.